New Zealand’s ONLY travel Guide Book devoted to the needs of the free and independent organic and eco-traveller. The ONLY travel guide in NZ to list organic food, eco-accommodation and environmental tourism in one place. It's brilliant! I have only just started reading it, but I think it's inspiring -- it encapsulates a vision for the kind of New Zealand I'd like to see more of! In fact, it makes me want to get away and start exploring now -- especially after the Christchurch earthquakes! This book is great. It's chatty, interesting and very easy to use. I got this book out the library but it's one I'd definitely buy for personal use or as a gift. Please fill in the short questionaire below. 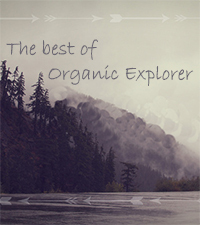 How did you find out about Organic explorer? Thanks for your interest, we'll be in touch!